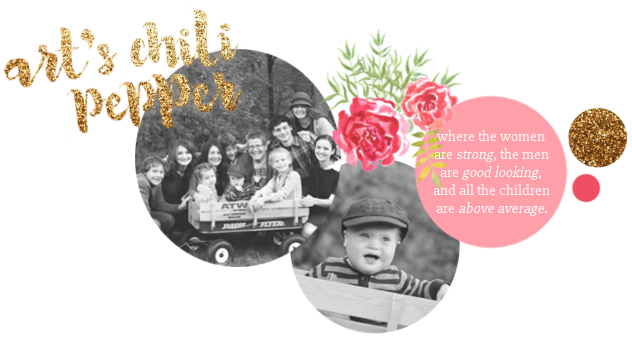 Art's Chili Pepper: Circle of Moms ~ Top 25! Thanks to you!!! How can I have so many incredible readers? It is hard to imagine a week has passed already. In case you didn't hear the news, Art's Chili Pepper came in third place in the Circle of Mom's Top 25. Anyway, I just really want to take a minute and say thanks for all your encouragement. It really is true that your emails are what keep me here. Sometimes I feel so overwhelmed and think I am going to take a break. Just the other day when my computer went out I said out loud about how much work I had to get done. Work meaning, emails to reply to and post requests to fill and questions to answer. And my hubby jokingly said about how I am so busy now. And I thought about it a while and said, maybe I should give it up. And he said, no, I couldn't do that because this is the way I use what God has given me. There are people who need me. That was kind of sobering to hear from him. It was also neat to hear. Because, while I try to use only my hour in the afternoon for blogging, imy family is always supporting me and brainstorming and at times making sacrifices so I can be here for you. Most of who are perfect strangers. It is such a blessing to have a family who are so encouraging to me and to each other. But that really is another post. But for here let it suffice to say, thanks to my super PR team who emailed, text and made videos to remind people to vote. The girls made this video the day after voting ended but I had a reader in need and so never got it up. You just have to love Fritz, Jamie and Arthur. Ha! My girl friend sent me a text and said she didn't know what was more exciting being voted to number three or being interviewed by nutty, nuttier and nuttiest. Just before they push the record button one of the girls said, "Mama, you have to talk like 'this' and don't laugh!" Now, the surest way to get me to laugh is to tell me not to. And try looking at Arthur and keep a straight face. ☺ And, for the record, my accent doesn't even belong in the same video with the girls. Have fun anyway. And as a special thank you for making Art's Chili Pepper one of the top 25 blogs for the second year in a row I am going to answer 25 questions. In the month of September I post an answer a day to 25 questions for 25 days. So leave your questions in the comment section here and I will get busy. Thanks for making this a great place to be!!!! I am so glad you came in third! I voted for you every day! And I love your blog, as you know and would be sad if you stopped. I would however, completely understand. How fun!! Love the video. You and your girls looks like your having so much fun!